This post has been lurking in my drafts folder since much earlier in the summer. I thought I should decide whether I was going to finish and publish it or hit the delete button. The fact that you are reading it provides the information required about that decision making process. I will be 50 later this year. I am not particularly bothered about the number or even the implications of the number. The day will come and go. @SteveChalke: If you view life at 50 in the same way as you did at 20, you have wasted thirty years of your life! This has made me stop and think. Over the summer I have been considering whether or not I should stop doing something that I have been involved in for the past thirty years. This is not because of a falling off of commitment or because I am becoming complacent and lazy as I wave to middle age on the way by. It is more to do with stamina and other changes that come along with the passing years. Sometimes we cling on to things just because we have done them for ages. Getting enough space to think about these choices and decisions in a very busy schedule can be difficult. However, we all need space to reflect, observe and think about where we are going and what we are doing with our days. This photo was taken in Glasgow a few weeks ago. The image of the photographer is very small in the overall frame of much larger structures. 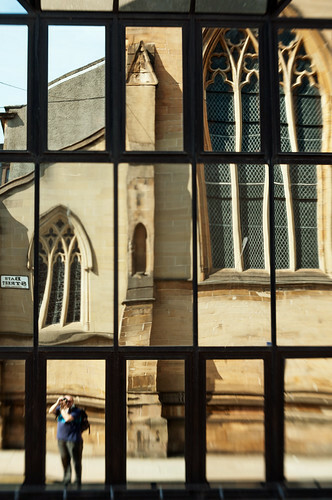 I like the fact that the reflection in the glass is so much bigger than the photographer. As we travel our journey I am very aware of the passing of time and of my very small part in that much bigger picture. I haven’t made that decision yet and am still struggling with it a bit. What I can say is that I am not the same as I was when I was 20, thank goodness. I trust I have not wasted the past 30 years of my life. Making time and space to reflect is a vital part of that growing process. This journey is not over yet. This entry was posted in Professional and tagged choices, journey, Reflection, thinking on 25 August, 2013 by Gordon McKinlay.